Successful investors often have very different approaches when it comes to the research process but one common thread that seems to come up again and again is that the best investors are voracious readers. Warren Buffett spends nearly every day sitting in his office and reading rather than tolerating a calendar packed with meetings and conference calls. Charlie Munger read so much when his children were growing up that they thought he was “a book with a couple of legs sticking out”. Comments on the importance of reading have come up time and again during Berkshire Hathaway annual meetings. People in the audience invariably nod and agree with the sentiment but most people do not follow through on the advice. Modern society provides an enormous number of distractions that seem to leave little time for focused reading. This provides a huge advantage to those who can tune out the distractions and devote the time toward reading. However, this is only a first step. Dedicating the time toward reading is necessary but, by itself, insufficient when it comes to improving results. Our time must be wisely spent and our attention must be focused. Depending on the source of the quote, Warren Buffett either reads 500 pages per week or 500 pages per day. Based on a statement made by Todd Combs, it seems like 500 pages per week is more likely to be the actual figure (and it certainly seems more attainable for the rest of us). The reading material was described by Mr. Combs as “a complete hodgepodge” rather than a pile of books. There isn’t any doubt that numerous S.E.C. filings would be found within that pile of reading material. There are many worthwhile reasons to read that have nothing to do with investing but presumably Mr. Buffett’s advice is related to the typical question he gets all the time: “How do you go about finding great investments?” The answer to this question invariably comes back to reading, but not just any kind of reading. In order to learn about companies in a manner that does not introduce too many preconceived notions or biases, one needs to go to primary sources. However, primary sources can be defined broadly or narrowly. A broad definition would include all of the information a company publishes about itself on its website, glossy annual reports, C.E.O. letters, company presentations, and quarterly conference calls. A narrow definition would be restricted to S.E.C. filings that are more driven by the concerns of a company’s general council than the head of marketing or investor relations. Effective techniques for reading books have been well documented for years but the same isn’t really true for S.E.C. filings. S.E.C. filings are legal documents that a company is required to file on a periodic basis and the consequences for making mistakes can be significant. Depending on the nature of the company, risks and disclaimers of a legal nature can vary in length. Nearly all companies include information that is, in some regards, repetitive or unenlightening due to the need for legal cover. While all information in a filing should be read prior to making an actual investment decision, trying to read filings sequentially on a page-by-page basis when just getting to know a company is not the best approach. When Buffett said read 500 pages/week, I think he meant meaningful content, not reading repetitive & boilerplate filing verbiage by rote. What are some of the possible techniques for approaching a filing and obtaining enough information to determine whether further study is warranted? In this article, we will take a look at some possible ways of approaching a 10-K report for a company that one is not familiar with for the purpose of determining whether further study is required. Readers who have been reviewing S.E.C. filings for many years and have their own method are probably not going to find the rest of this article very interesting but, based on questions received on Twitter and email over the years, many readers might benefit. The best way to get an understanding of a business at a more than superficial level is to read the company’s latest 10-K filing. There are important differences between a company’s 10-K filing and an annual report, especially for larger companies. Annual reports are typically glossy marketing materials that start off with a one or two page C.E.O. letter and are followed with magazine style pages showcasing the company’s products or services. They are designed to make shareholders and the general public “feel good” about the company and its management. Useful information could very well exist in this material but this information will be contained within a specific agenda. This agenda is not necessarily nefarious but it will always seek to influence our opinion. It is best left until after one has read the 10-K. 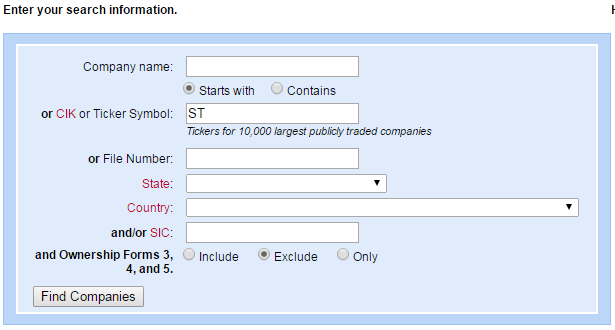 Stated simply, a 10-K report is an annual report required for all public companies that must be filed with the S.E.C. within a short period of time following the end of a fiscal year. It is critical to read the 10-K filing and many other filings, in their entirety, before one actually makes an investment decision. But if our goal is simply to “get to know” the business in order to decide if we want to allocate further time, there are better ways to go about the task. The more efficient we are at looking at a 10-K and quickly deciding whether more study is warranted, the more time we can allocate to looking at additional 10-Ks. 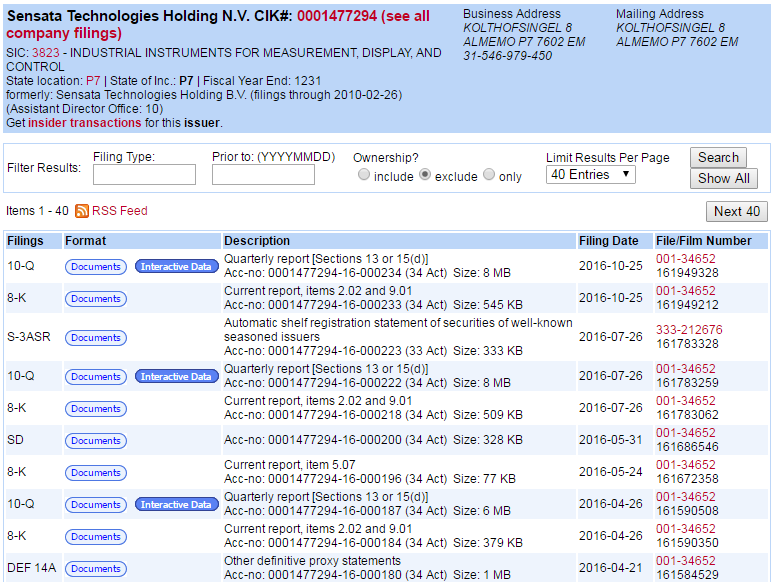 We can see all of the 10-K reports since Sensata went public in 2010. For purposes of our initial review, we will want the latest 10-K report filed on February 2, 2016 (2016-02-02). 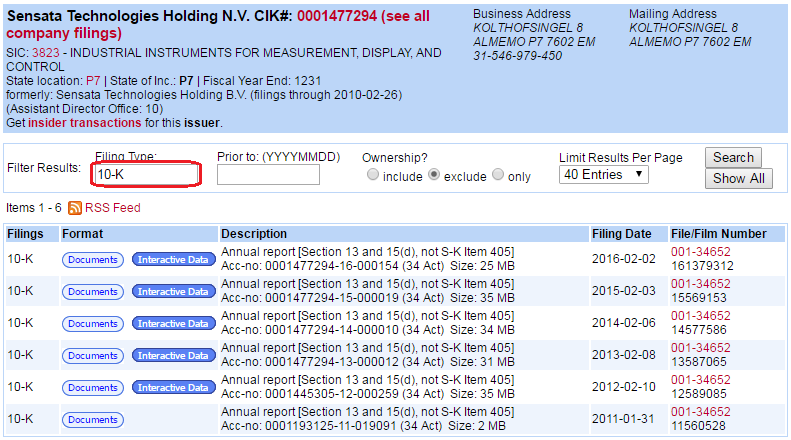 Clicking on the Documents option for the latest 10-K and then on the “Form 10-K” link will bring up the actual report. We can see that this report is about 147 pages long which obviously would take a great deal of time to read from cover to cover, and indeed a cover to cover reading is needed before investing but not in order to gain a basic understanding of the business. In order to obtain a basic understanding, we will focus on a few specific areas. The business summary is only nine pages long, running from pages four to twelve. The purpose of this section is self-evident. Management is supposed to provide a clear overview of the economic purpose of the business, the products or services that it sells, the key economic conditions under which it operates, some sense of its history, and a view of the competitive conditions within the industry. This entire section should be read carefully in its entirety. From reading the overview, we quickly comprehend that Sensata is in the business of developing, manufacturing, and selling sensors and controls that are used in a variety of applications. These sensors are customized for specific uses and, at a simplified level, translate a physical phenomenon such as pressure into electronic signals that trigger a microprocessor to take some kind of action. The company’s principal end-markets include automotive, heavy vehicles, HVAC, industrial, aerospace, and semiconductor markets, among others. The company is research driven and works closely with customers. Operations are diversified with meaningful fixed assets and revenues throughout the world. The automotive market is the most critical with over two-thirds of revenue attributable to that end market. Management provides a brief history of Sensata which has roots going back to businesses that were founded in 1916 and, more recently, was part of Texas Instruments until 2006 when Sensata became an independent company. It is also apparent that the company has grown through numerous acquisitions since 2006. This presentation quickly allows us to understand a little bit more about the business by translating a vague term like “performance sensing equipment” into applications that we can all understand more easily. In general, we want to see an attempt by management to make the business understandable to investors. In this case, the business sells highly technical components but we can generally understand what these components are used for without being technical experts. Management also breaks down revenues by category for the past three years giving us a clear sense that pressure sensors are the most important aspect of the segment’s operations. 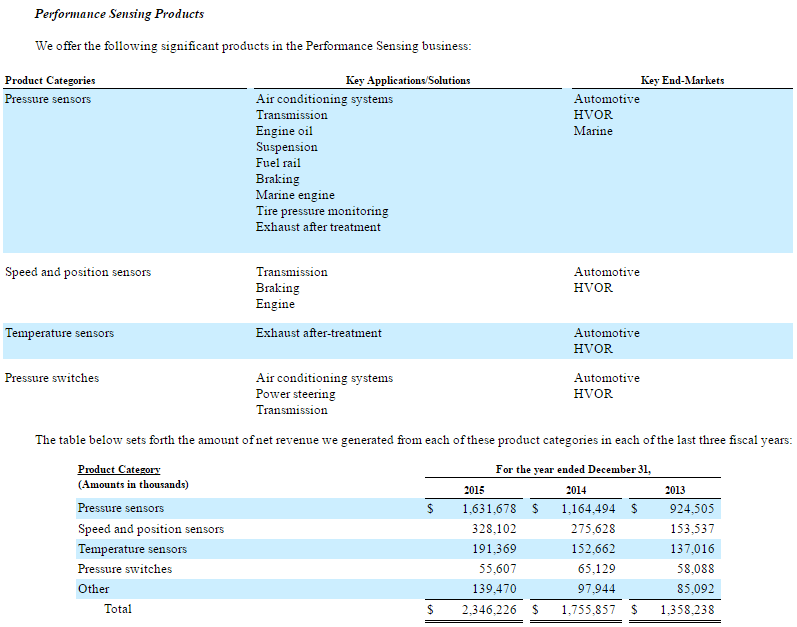 A similar presentation exists for the Sensing Solutions segment which we will not show here since we aren’t attempting to analyze Sensata, but rather to provide an overview of what is contained within its 10-K. The business overview proceeds to cover intellectual property, customers, competition, seasonality and other factors, all of which adds to the overall picture and should be reviewed carefully. 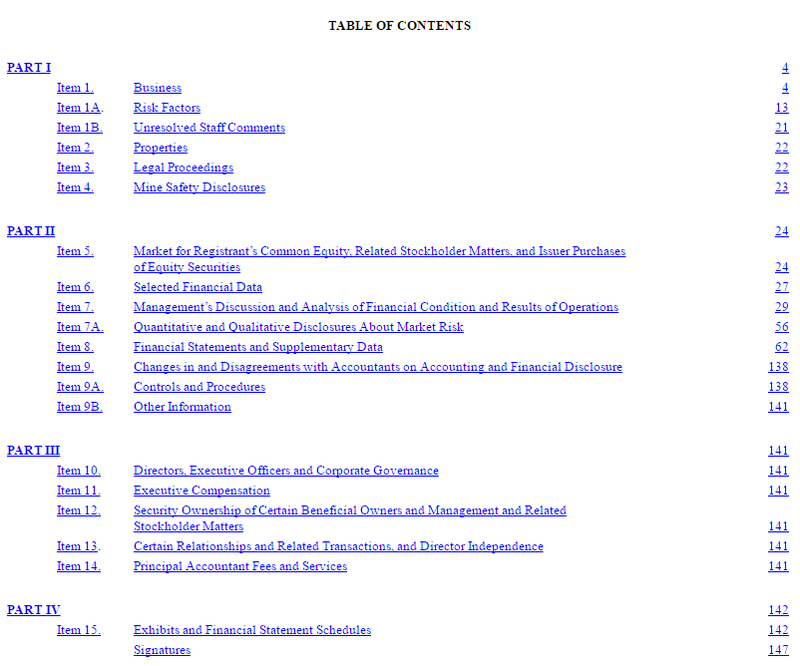 The business overview section is only nine pages long and takes perhaps 15 to 30 minutes to review. However, it provides enough information for most people to determine whether to short-circuit the process and move on to something else or to continue the process. If one reaches the end of the business summary and is left with a great deal of confusion regarding how the company operates, it can either mean that management has done a poor job explaining the business or that the industry is outside an investor’s circle of competence. In either case, it is probably best to move on to another company. The next major section of a 10-K involves a discussion of risks facing the business and the industry in which it operates. Risk is a critical component of evaluating a business but it must be noted that this is also where the lawyers get heavily involved. S.E.C. 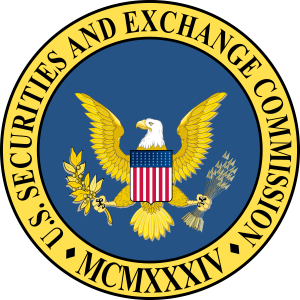 filings are legal documents and a failure to make required disclosures can invite shareholder lawsuits. The lawyers who write these sections are usually more concerned with guarding against lawsuits than providing much enlightenment. This is not to suggest that these risks shouldn’t be reviewed, but rather to put the section into context. This section isn’t terribly enlightening. Nearly all businesses operate in industries that are highly competitive. In nearly all industries, heightened competition results in companies feeling pricing pressure. The description does provide a little more context, but really just states the obvious. Our recommendation for the risk section, when it comes to an initial reading of a 10-K, is to quickly review the title of each risk but to not review the entire description of each of the risks. Areas of particular concern that would determine whether an investor is going to proceed with research on the company should be reviewed in full but areas that appear to be boilerplate should be left for a more thorough reading at a later time. The same is true for the legal proceedings section of the document. Digging a bit further into the details, we can see that amortization of intangibles is a very significant line item and that management has a history of classifying costs under “restructuring and special charges”. We can also see that the company is highly leveraged with $3.6 billion of debt and $1.7 billion of shareholders equity. The best way to review this table is to take notes on factors that seem unusual or worthy of further study and to come back to it after a more complete review of results. A review of this section could also short-circuit the process if an investor notes that certain attributes fall outside his or her parameters for investment. For example, leverage ratios above a certain level may leave an investor uncomfortable regardless of other aspects of the business. If that is the case, the investor can put this 10-K in the “too hard” pile and just move on. Arguably, the selected financial data section should be read even before the business summary to efficiently short-circuit the process by filtering for unacceptable attributes. This is the section of the 10-K where management has the opportunity to put the company’s recent results into the proper context. However, this section also includes much information that is redundant with the business summary section and should be skipped during a first reading of the 10-K. In the case of Sensata, the MD&A begins with overview information that, in some cases, appears to be taken verbatim from the business summary. There is also information on the history of the company that is basically an exact repeat of the information provided previously in the report. It is unclear exactly why redundancy exists here, and the amount of it varies from company to company, but it is a fair assumption that we can blame the lawyers and their attempt to limit legal liability. It is useful to know that the company is relatively sensitive to commodity prices, especially related to Chinese production of rare-earth elements. Also, we note that the company has a hedging program in place and that derivatives gains and losses are recorded in the “Other, net” category, which provides some detail on an area we noted when looking at the five year summary of selected data. A great deal of information is presented here and discussed in much detail in the paragraphs that follow. Different companies will present the data differently here but the table shown above is fairly typical. 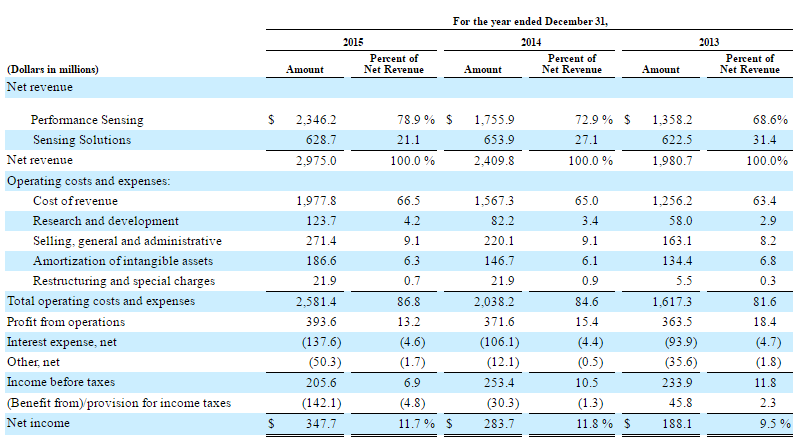 We can see revenue by segment and operating costs expressed in dollar terms and as a percentage of revenue. Trends in both the movement of revenue and costs over time and relative figures such as operating margin give the reader a quick view of recent trends. Here it is interesting to take one note that would escape someone who looks only at a simplistic figure such as net income margin. We see that the net margin is basically unchanged between 2014 and 2015. However, the lack of movement in that measure is due to the fact that the company realized a materially higher tax benefit in 2015 than in 2014. 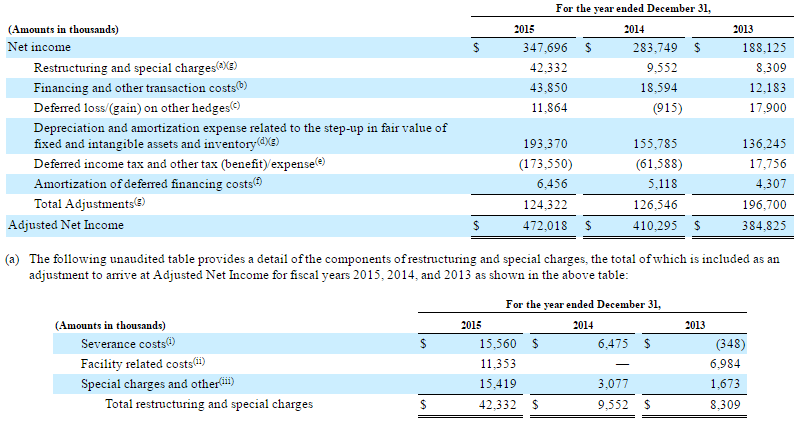 In reality, gross margin was significantly lower in 2015 and operating costs were also elevated. A transitory factor such as a higher tax benefit holds less weight than factors such as gross and operating margin trends when looking at a company’s results of operation. Do we take non-GAAP adjustments at face value? No good analyst should do that but it does not follow that all adjustments are illegitimate. At this stage, it is unlikely that the reader understands the company well enough to decide whether the adjustments are warranted or not. However, we would make one skeptical note right off the bat: management has a history of restructuring charges every year yet wants investors to ignore those charges in adjusted net income. A company that has restructuring charges on a yearly basis cannot really claim that such charges are “unusual”. The MD&A proceeds to discuss cash flow, debt, liquidity, and capital resources. All of these areas are important but we would recommend reviewing these areas quickly, to be revisited if the company is more seriously considered after reading the financial statements. For purposes of this article, we will assume that the reader knows what to expect in this section and will not go into much detail other than to suggest a selective reading of the notes for this initial review of the 10-K, with a complete review to follow once the company is under more serious consideration. One exception might be to review the notes on business segments more carefully at this stage if there are questions regarding the nature of the segment economics as they relate to the consolidated financial statements. In terms of sequencing, some readers may want to slightly reverse the recommended order in this article by reviewing the five year summary first, followed by a quick look at the financial statements prior to reading the business summary. Investors who are more quantitatively oriented and have checklists of factors that would disqualify an investment might do this as a process of elimination. The risk is that without understanding at least the basic attributes of the business, certain figures in the financial statements may be misconstrued in some way that obscures the real economics. Ultimately, the sequence of review is up to the investor and has to match his or her preferred process based on experience. It is somewhat dangerous to suggest that an investor should not review a 10-K report word-for-word, but that is not really the intent of the recommendations in this article. Instead, we are suggesting a way in which an investor can more quickly assess whether a company warrants further study. In a perfect world with unlimited time, it might be fine for an investor to go through a 10-K line-by-line and word-for-word during the first reading. In the real world, this will require an investor to be exposed to far fewer companies than would otherwise be possible. In a competitive investment landscape, it makes sense to be exposed to as many companies as possible and to do so as efficiently as possible. The ideas expressed here could be one way to do that. A sub-set of the companies that are initially reviewed would receive more thorough attention at a later time and, always, before any investment decision is made. Disclosures: No position in Sensata. Sensata is only an example based on a recently reviewed 10-K and this article doesn’t provide any analysis of Sensata.